The Riviera Maya is a tropical paradise located on the Caribbean Sea just 1500 miles from the equator. June is the hottest month in this area, but it starts to warm up in May and the heat lasts into October or November. If you are vacationing in Cancun, Playa del Carmen or the Riviera Maya and need a break from the heat, obvious places to cool off would be your resort’s pool, the azure Caribbean Sea, or even your air-conditioned hotel room. However, there are other places you can go to cool off while at the same time experiencing the natural beauty, fun and adventure that Cancun , Playa del Carmen and the Riviera Maya have to offer. Cenotes are natural sinkholes that occur all over the Yucatan Peninsula, some are completely open, like a lake, and some are totally covered, like a flooded cave. Cenotes can feature stalactites and stalagmites, fish, interesting rock formations and plant life. There is nothing like a dip in a cool freshwater cenote on a sweltering day. Tres Rios Nature Park is home to five cenotes. Yal-Ku is an aqua blue lagoon located in Akumal, a small beach town south of Playa del Carmen. Here salt water mixes with fresh and swimmers and snorkelers can see all different types of marine life. There is a small cover charge. Changing rooms and restrooms are available. There is also a small snack bar. 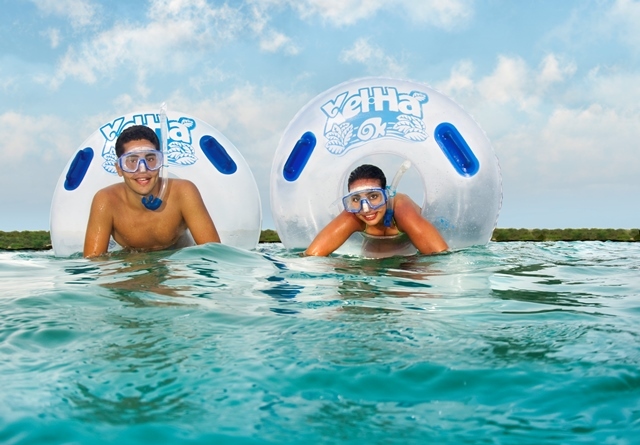 Xel-Ha is a breathtaking natural adventure park. Visitors can keep cool by snorkeling in the “world’s largest natural aquarium” or floating down the lazy river. You can also jump off the cliff of courage or test your balance on the “trepachanga”. Paid entrance to Xel-Ha is all inclusive, so you can enjoy the buffet and cold “cerveza” as well. During this 3 ½ hour tour, you’ll hike through flooded underground caves filled with stalactites and stalagmites that took thousands of years to form. The Mayans considered the mysterious caves and cenotes that lie below the surface of the Yucatan Peninsula to be sacred portals to the underworld. The tour is followed by a simple yet delicious buffet of regional dishes. Who doesn’t love a waterpark? Located at kilometer 25 in Cancun’s Hotel Zone (think close to the airport), Wet n’ Wild guarentees a day of fun for the whole family. The park features a kids park, a wave pool, bumper boats, a lazy river and various wáter slides. A meal combo is included with your paid entry. Have you been to any of these “cool” places? Which is your favorite or which ones would you like to visit? Book your vacation at Hacienda Tres Rios now and we can help you set up a tour to one or more of these places to cool off in the Riviera Maya.